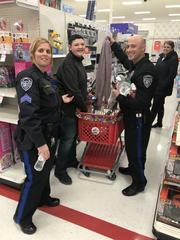 The fifth annual Heroes and Helpers event was held Wednesday at Target on Route 1 in South Brunswick. The event recognizes some truly exceptional kids with a special day to honor their accomplishments. These ten recipients were each selected by their individual school for their outstanding work and character. These kids are involved, formally and informally, in school and peer leadership activities. Some are student council representatives, Safety Patrol members, Bus Helpers, Classroom Helpers, and Peer Mediators. They are often thought of as the unofficial school good will ambassadors, bringing smiles to all they meet during the day. They are role models, setting a good example for others to follow. These kids are known to help staff in the schools, provide motivation and guidance to classmates, and to offer kindness, compassion, and a cheerful word to all they meet throughout the day. Almost every single nomination mentioned the word “positive”, which says something about their attitudes while they manage all of this. 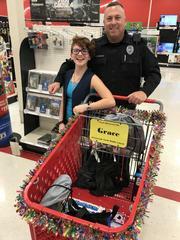 Each honoree was given a Target gift card, and their own personal police officer to accompany them through the store on their shopping spree. 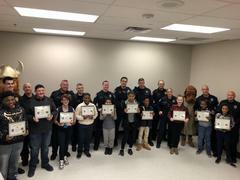 The program was funded by a partnership between Target, the South Brunswick School District Administrators, and the two South Brunswick Police Department unions, PBA and FOP.